Deliver a package to Caius Cosades in Balmora. Complete the character creation process by asking Sellus Gravius about your duties. Travel to Balmora by silt strider or on foot. Optional: Go to the South Wall Cornerclub and ask Bacola Closcius for directions to Caius Cosades. Head over to Caius' house. It is in the northeastern section of the town. Deliver the package to the shirtless man, Caius Cosades, inside. Respond "yes" to all of his questions, and he will make you a Novice in the Blades. As you awaken, you will find yourself in a boat in Imperial custody. You will be escorted to the Census and Excise Office, and will be released after your character creation is complete. 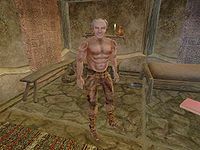 Before you leave, you are given orders to take a Coded Package to Caius Cosades in the town of Balmora, where you will be given further instructions. Sellus Gravius will give you a release fee of 87 gold, the package itself, and more detailed instructions to be used as a reference. He also mentions that someone in the South Wall Cornerclub should know where to locate Cosades. When you are ready to go to Balmora, you can talk to Darvame Hleran, the silt strider operator, and pay her to take you there. Alternatively, Elone in Arrille's Tradehouse can give you directions if you prefer to walk. As the instructions mention, head over to the Cornerclub, which is in the southeastern corner of Balmora. After speaking with some of the people there about Cosades, they will refer you to Bacola Closcius, who is upstairs. He will then give you directions on where his house is located, and how to get there. Caius' house is the most northeastern in the town. Alternatively, you can head over to Caius' house directly. There are no repercussions for not speaking to Bacola Closcius. Caius will accept the package but tells you very little about its contents or his plans for you. After promising that you will follow his orders, he will name you a Novice of the Blades. If you decline, you can come back at any time. Ask for orders and he will tell you to get some experience under your belt and give you 200 gold if you are level 3 or lower. If you are level 4 or above, he will simply compliment you on your abilities. You do not actually need to gain any experience to proceed at this point, but it is advised as the subsequent quests can be quite challenging for low-level players. Caius suggests you join a guild or a Great House, whose starting quests are easy even for level 1 characters and can help you obtain some gold and better equipment. There are a lot of items available for the taking during the character creation process. Before you leave Seyda Neen, you may want to take some time to familiarize yourself with the game. Talk with the locals, explore the territory, and get some loot. You can get information and additional items by visiting the various Blades Trainers (only if you are level 5 or lower) that Caius speaks of. Each time you talk to Cosades without the package, refuse to hand over the package, or refuse to join the Blades and accept Cosades' quest, his disposition drops by ten. Completion of this quest results in a disposition increase of all Blades Trainers except Elone. This is fixed by the Morrowind Patch Project. The bearded guard on the prison ship may not come and tell you to go with him, forcing you to start a new game. 1 My orders are to go to the town of Balmora in Vvardenfell District and report to a man named Caius Cosades. To find out where he lives, I should ask in Balmora at the cornerclub called South Wall. When I find Caius Cosades, I must give him a package of documents, and wait for further orders. 2 Elone at Arrille's Tradehouse gave me detailed directions to Balmora. 5 A patron of the South Wall cornerclub called Caius Cosades "an old sugar tooth," and says to ask the owner, Bacola Closcius, about Caius Cosades. 10 Bacola Closcius says Caius Cosades rents a little bed-and-basket up the hill from the South Wall. Go right up the stairs from the front door, then left at the top of the stairs and down to the end of the street. 11 I reported to Caius Cosades, but I haven't given him the package of documents yet. 12 I gave Caius Cosades the package of documents. Caius Cosades says the Emperor wants me inducted into the Blades, the Imperial Intelligence service, with the rank of Novice. Caius Cosades would be my Spymaster, and I would follow his orders. Should I do as the Emperor commands? I'm not sure... I want to think about it. 14 Finishes quest I have given Caius Cosades the package of documents. And, by the Emperor's command, Caius Cosades has inducted me into the Blades, the Imperial Intelligence service, with the rank of Novice. Caius Cosades will be my Spymaster, and I'll follow his orders. 18 Finishes quest Spymaster Caius Cosades gave me 200 gold to spend as I please. And he also told me to establish a cover identity as a freelance adventurer. He suggested I join the Fighters Guild, or Mages Guild, or Imperial cult, advance in the ranks, gain skill and experience, or go out on my own, get freelance work. Then, when I'm ready, I come back to Caius for orders. 20 Finishes quest Spymaster Caius Cosades told me to establish a cover identity as a freelance adventurer. He suggested I might find some work at the Fighters Guild and the Mages Guild. When I'm ready, I'm to come back to him, and he'll have orders for me. 22 Finishes quest Spymaster Caius Cosades suggested I maintain a cover identity as a freelance adventurer, just to avoid drawing unwanted attention. And he says he has orders for me, whenever I'm ready. This page was last modified on 25 September 2018, at 04:03.